Entering the 1959 season, Ted Williams had solidified an unequivocal place in American history, with his hero stature substantiated by his standing as baseball's undisputed greatest hitter as well as his two fighter pilot stints in WWII and the Korean War in which he shot down a total of 16 enemy aircraft. Approaching his fourth decade as one of our National Pastime's all-time icons, the "Splendid Splinter" was now the highest paid player in the game after signing a whopping $125,000 contract to continue his career with the Boston Red Sox. To commemorate this immortal slugger's virtually unparalleled accomplishments, the prestigious Fleer baseball card company issued an 80-Subject "short-printed' set with ALL of the cards depicting the one and only Theodore Samuel Williams. Cards include significant moments from the Splendid Splinter's remarkable life including legendary baseball moments (with several subjects including immortals such as Babe Ruth and Jim Thorpe), some of his favorite pastime activities (including his passionate love for fishing), and his aforementioned wartime achievements. Presented here is one of the most desirable and scarce keepsakes from that momentous set, an extraordinary 1959 Fleer wax box including 24 unopened wax packs with 6 cards per pack. Thus, these near-mint/mint packs total to an amazing 144 subjects that most likely include immaculate-like aesthetics since they have been safely tucked away for the past 60 years. 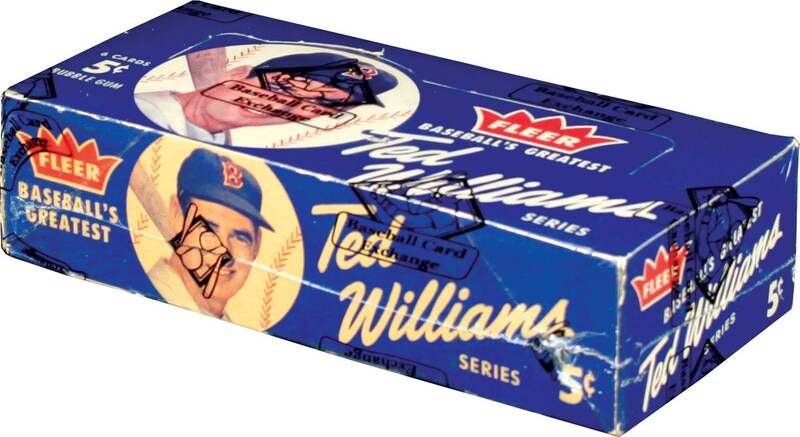 Most significantly, the wax box has been authenticated and shrink-wrapped by BBCE (Baseball Card Exchange), Steve Hart's renowned company that unquestionably resides as the foremost authority on unopened wax material. Presenting itself in solid NM/Mint condition, the box portrays near-perfect corners, no apparent dents and/or creases, with its sheer paucity level and immense desirability surely justified by a 24 pack/8-card unopened box recently fetching nearly $34K. Ted Williams achieved his lifelong dream of walking down the street and have people passing him stating "there goes the greatest hitter that ever lived", and we cannot imagine a finer testament to the immortal "Teddy Ballgame" than this extraordinary memento that offers the collector a grand opportunity to compile a possible hoard of "Mint 9" and "Gem Mint 10" 1959 Fleer subjects.